I love it when restaurants will take a little twist on the traditional nicoise and use salmon instead of tuna. I like tuna, but I love salmon. Unfortunately, when I ordered a salmon nicoise out at lunch recently, it was somewhat of a disappointment so I knew I would have to make my own at home soon to make up for it. This was a great version and the vinaigrette was a new experiment using some grapefruit vinegar. If you don't have grapefruit vinegar on hand, just use whichever kind you prefer. Heat the olive oil in a small pan and cook the salmon for about four minutes on each side and remove to a cutting board. Microwave creamer potatoes for four minutes until soft and green beans for 1 minute until just tender. Slice the tomato into quarters and drain the olives and caper berries. Mix together the olive oil, vinegar, salt and pepper and dress lettuce. 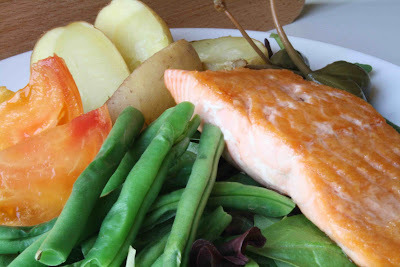 Place lettuce in a serving bowl and top with potatoes, salmon, green beans, capers, olives and tomatoes. Enjoy! What a great idea to use salmon! What a healthy, tasty dish! Looks divine! What a great looking dinner.